Shipping weight = 32.00 lbs. The Pet Gear NV No-Zip Pet Stroller was created by combining the all of the best features of other Pet Gear strollers into a top-of-the-line pet stroller that every owner and pet will envy. Pet Gear’s No-Zip technology means that you can easily gain access to your pet without fumbling with difficult zippers when trying to open and close the stroller. The NV No-Zip Pet Stroller also features an elevated paw rest so your pet can easily look out of the stroller by using the front bar for support. The stroller navigates over rough terrain with ease, whether jogging or strolling, thanks to the front locking wheel. It features a plush bolster pad, air tires for a smoother ride, stylish colors and embroidery, as well as a new panoramic view window that allows your pet to remain safe inside of the stroller without missing any sights. Note: For pet use only. Recommended for pets up to 70 lb. Very outstanding product! Rolls very easily and is well made and worth the price. Best carriage! You wont regret buying this for your baby! I own 2 of these carriages for my little girl. I also like to jog and my little one loves the wind blowing in her face. This carriage is amazing. I jog on pavement haven't tried it on a dirt road. Sturdy well made carriage. Like a said I have 2 one for each of our houses, I did put extra padding inside for more comfort. Love it stylish sturdy fabulous!! Great stroller. Is much easier to push than my old one. The shocks are great, turns very easy. It is heavy so I am keeping my old stroller for the car. I love it ..sturdy , nice and roomy, just wish the cup holders for me were a bit deeper so my drinks didn't fall out. My daughter loves it. Strong durable and a great looking product. It absolutely the best!!! Can’t wait to take my 2 little ones for a ride and know that they are safe.Very, very nice stroller. Worth the money. ?? First experience with a doggy stroller, but were extremely please with the quality and style. Ms Hattie loves her new ride! We have had a very nice pet stroller for years. This one ups the features. The wheels make their ride much more smooth. While they are the same size, they seem to have more room in this one. The snap down top is nice although it has gone done when we were not trying to close it. We did lose the back zipper door but we seldom used it. superb quality & easy to put wheels on!!!!! Wonderful, sturdy, well made stroller for even a tall person , such as my self (6ft). I purchased the stroller for my two Toy Schnauzers between 6 & 8 lbs. Easy to put together, great features, will last a long time. Enjoy?????????????? Researching for dog strollers led me to this item. Price was the best online I could find. We picked this stroller because one of our dogs has a paw issue and we wanted him to be able to go out with us when we walk the other dog. Since there is plenty of room, they both can fit inside if need be. Love the wheels for a smooth ride! what is the largest stroller you have and what is the maximum weight? BEST ANSWER: This stroller will hold up to 70 lbs. Is it easy to fold up and quick to fold up ? BEST ANSWER: Yes it is easy to fold up, but still very bulky. It doesn't fit well in the trunk of the car so we just put it in the back seat to take to the park. Our dog loves it! It is easy to push too. I hope this was helpful. Yes! Itâ€™s very easy. At first time, it was not easy for me but once I found out that you need to turn the handle before you fold up, it was very easy. Yes you push one button to fold and there is a latch to keep it folded tightfolded. Then lift into trunk etc. You can collapse it using one hand. It is very easy. Push button,turn handle and it collapses. Once you figure it out, it is easy. We had a learning curve. It is large even folded. Itâ€™s quite easy once you get used to it. Can a miniature schnauzer, 22 lbs., lie down in it? BEST ANSWER: I'm sorry that I can't answer your question because I have a Maltese, and she only weights 3.5 lbs. On a side note, if your dog is able to lie down in it, definitely get this stroller. It is fabulous, and my Coco Chanel looks like she's being pranced through the neighborhood in a Rolls Royce. I have a 12 pound Havanese and she can lie down in it with room to spare so I think your dog will fit. BEST ANSWER: Skyline is medium dark blue/teal accents and bolster pad with the black stroller. does this have a storage compartment on the back? BEST ANSWER: There is not a storage compartment in the back. There is a small basket underneath however. Is the big enough for a 30 pound beagle mix? BEST ANSWER: First, this is a great pet stroller. But that could be a very tight fit for a 30 pound dog. I bought this for my two 14 pound RagDoll indoor cats and it is different with two animals. Perhaps a 30 pound dog would be more compact and not as spread out as our cats. Check the interior measurements of the stroller and those of your dog to check. Good luck. I think so. Our 14# poodle/chi/peke mix fits with plenty of room to spare. The only thing that would give me pause is if your beagle mix is very tall. In my opinion it is. We have a 27 lb Boston terrier and he loves his stroller. My cavalier is 24 lbs and has plenty of room, so I would say yes. Yes, it can hold about 3 Schipperkes (20 lbs each). Most definitely!! My 7 lb Yorkie loves our walks!! Is that his stroller collapsible? BEST ANSWER: Yes, but it is large and heavy. Don't get me wrong it is a great stroller but it is not a small one when collapsed. Yes, however, the main problem with this stroller is that the tires do NOT hold air over time. Yes, by twisting an unlocking switch on center of handle. The stroller will collapse downward. I don't believe it is. My dog loves going for walks in it. She is seven pounds. Yes this is collapsible. It fits into my Mercedes SLK trunk just perfectly. Yes itâ€™s very easy to fold it to put into the car trunk! 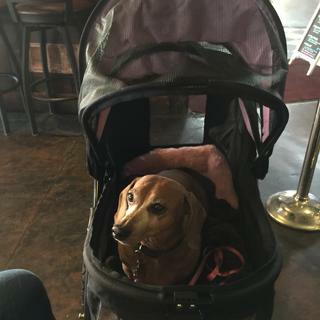 Can 2 7 lb dogs fit in this stroller? BEST ANSWER: I put three 9 pound poodles in it. They have to get along well. Two is not crowded but three does require dogs that don't mind touching. None of mine really lay down or sleep in it. If one wanted to stretch out laying down, two would be harder and three would be impossible. YESðŸ‘ðŸ‘ðŸ‘ I purchased this stroller for my two Toy Schnauzers , betwee 7& 8lbs. Pet Gear NV Stroller is better made than most. Very sturdy, easy to walk with t my 6ft height. Easy to put together. A very outstanding product, purchased at Statelineack. Enjoy!!! Yes, 2 dogs can fit, I have used this carriage for 5 years and fit my toy a miniature poodles in it they were was very comfortable and always had enough room. Over the years (25) this has been the best transportation carriage . Absolutely---I have put 3 20 pounds dogs in it before without any problem. I have 2 dogs both weighing 9 to 10 lbs and they are fine and love it. BEST ANSWER: It does fold up. You can also take wheels off. It does take a lot of room, even folded up. It is being used by an older corgi. She loves it and they have been traveling for the past month in their car with it. Even though we bought it for our corgi, we haven't used it yet But wanted to have it just in case. Hello! How is this stroller for running/jogging? I am an avid runner who would like to take my special needs dog on a run with me...at least for 4 to 5 miles...thank you! BEST ANSWER: I own 2 of these carriages for my little girl. I also like to jog and my little one loves the wind blowing in her face. This carriage is amazing. I jog on pavement haven't tried it on a dirt road. Sturdy well made carriage. Like a said I have 2 one for each of our houses, I did put extra padding inside for more comfort. Hi! We love the stroller! We don't run with it though but I would think it would be enjoyed that way. It handles nicely and our dogs seem to enjoy the ride. Thank you Margaret for the feedback! It is much appreciated! Will it hold s 35 lb dog? Rose color not dark blue? BEST ANSWER: This item is available in skyline which is a blue turq color inlay, or rose which is a raspberry pink inlay. That is showing in the picture. The outside is a dark color? Is this stroller big enough for two Mini Schnauzers 14+22 pounds? BEST ANSWER: Yes the stroller is big enough for 2 dogs. We have 3 Maltese, 2 - 12 lb. & 1 - 4 lb. We are very happy with this model. How do the tires hold up when getting stickers? BEST ANSWER: A friend is using this for her corgi. They live on a lake and not in the city. Haven't heard any problems. We were going to use it in Canada on the trails, but our corgi is still walking just fine. We have it , because someday we may need it. Unless the thorns have nails, this cart is very well made.